When I migrated to Australia, the only English words I knew were ‘yes’ and ‘no’. I used to sit quietly in class but often I wouldn’t understand what the teacher was explaining. I was scared that if I asked a question in class, I would be laughed at. I had only been in Australia for a year and a half when I joined The Helmsman Project. I hadn’t been at my school for long and was nervous because I didn’t know the other boys on the program. But there is no discrimination or judgement on The Helmsman Project - you are human and we are all the same. This helped me gain the confidence to talk to people and put my hand up to ask questions. Because of this, how I feel about school has changed and I am enjoying classes more. I never knew what skills I had in me until The Helmsman Project. On the first day of the program, my coach came in with a list of different skills and asked us to pick which ones we thought we had. The only two I picked were creativity and being religious. We all have so many skills inside of us but if it weren’t for the coaches and the boat adventure, I wouldn’t know what skills I have. Through the program, I have found that I am good at communicating and solving problems. I have also learned that I am a good leader. There were a lot of challenges on the adventure education trip. One of the big challenges we had was to climb up the mast. It was really, really high and I was scared but I was the first one to volunteer to do it. I went all the way up the top and once I was up there I really got over my fear. As a team, we faced the challenges on the boat and, by the end of The Helmsman Project, we all got through them by working together. We realised we could do anything we set out mind to. Since I have completed The Helmsman Project, my mum has noticed a big change in me. I can see she is proud of who I have become, that I am attending class and working towards my future. I have been involved in a lot of different programs, but The Helmsman Project is the one that made a really big difference for me. 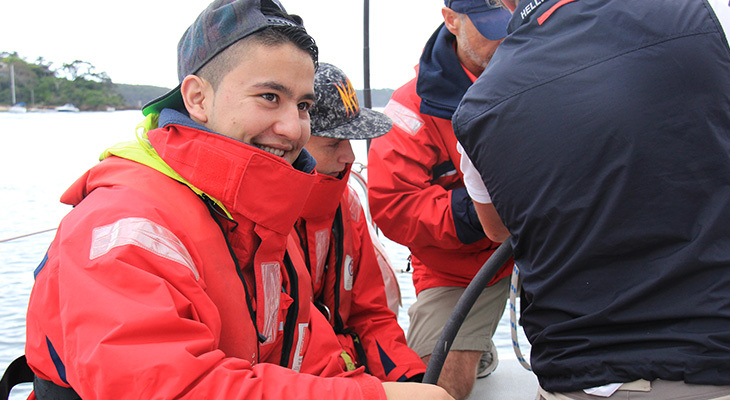 The Helmsman Project brought me closer to my career by showing me the skills I have. I am now doing my Assistant in Nursing certificate at Liverpool Hospital and would like to become a nurse or paramedic. I want to tell younger Year 9s to never give up on their dreams. Don’t worry about who you are and just keep going forward and believing in yourself. There are a lot of students who need the support a program like this offers. I want to thank The Helmsman Project for helping people like me to become confident and work towards a better future.